Gearhouse had supplied Sky Sports with a bespoke portable flyaway production solution for its live Formula 1™ coverage since the UK broadcaster began televising the sport in 2012 through its dedicated Sky Sports F1 channel. 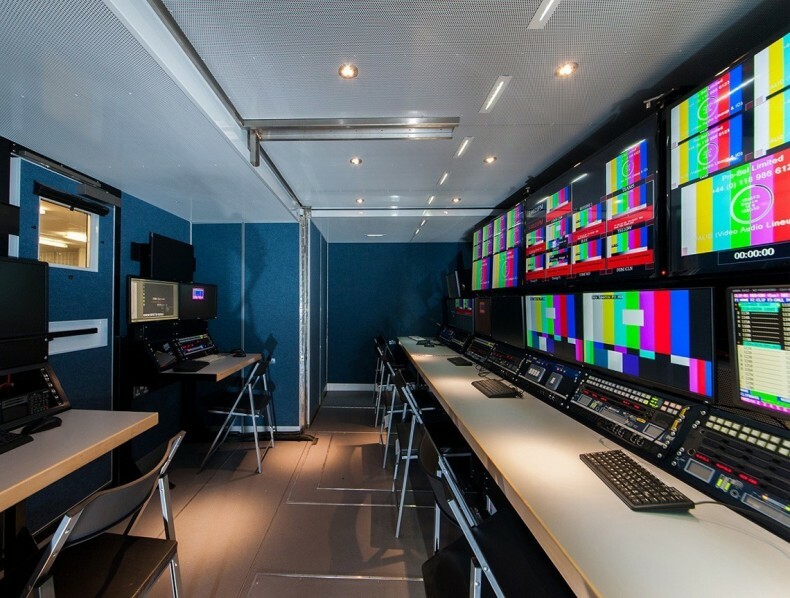 The interconnecting portable modular rooms that formed the flyaway included EVS live broadcast solution workflows, and were designed to be transported from race to race across multiple seasons. Using the same solution at each circuit meant the production team didn’t have to adapt to a new set up each time and could concentrate on delivering quality coverage, rather than worrying about the facilities that they would be working with. However, with shipping costs rising, and the broadcast industry being challenged to deliver more for less, Sky Sports was keen to reduce its operational costs wherever possible. To achieve this, Sky Sports wanted to cut the amount of kit they were having to send out for each race. However, there was an important balance to strike with taking less equipment, while not affecting the overall quality of coverage that fans had become accustomed to. Gearhouse’s in-house systems integration team worked closely with Sky Sports and leading manufacturers including EVS, to design a lighter, more flexible and future-proof flyaway system called OBPod. Everything within OBPod, from components, fixtures, materials and equipment, was scrutinised to ensure it could deliver the highest production levels, while at the same time being robust enough to stand up to the rigours of international shipping. As such a major user of EVS equipment, Gearhouse appreciated the efficiencies and reliability offered by its solutions. While evaluating the available options for OBPod, Gearhouse opted for the established EVS workflows that had worked so well in the original flyaway. OBPod consists of six interconnecting pods, all built on the standard air freight PMC pallet rectangular container footprint to simplify administration. Everything that could be pre-installed was, such as all of the monitors and cabling, to reduce rig and break down times, as well as the number of flight cases required to transport equipment. There is the dedicated EVS operational pod, an audio pod, an edit pod, a production gallery and an MCR (Master Control Room), which houses the broadcast infrastructure. Three of the pods have expandable sides so the space can be increased, similar to an OB truck, giving the crew a more comfortable environment to work in. The EVS pod is equipped with state-of-the-art solutions designed to maximise the live production capabilities of OBPod. Four XT3 live production servers are linked via EVS’ XNET media network and 10 Gigabit Ethernet for ingest, playout and replay purposes. The four servers let Gearhouse manage up to 48 HD channels at a time and allows them complete media control from ingest to playout. The media sharing network enables fast, efficient playout of media from the servers through any output channel. All of Sky Sports’ on-site ingest and playout is carried out by the XT3 servers. Two are used in a Multicam LSM configuration for EVS operators to create live replays during broadcast. In a sport as hard and fast as Formula 1™, operators must know their systems can work quickly and efficiently so audiences don’t miss a second of the action. The remaining two servers provide additional ingest and playout channels to support third-party analysis platforms for Sky Sports’ coverage. Working seamlessly with the server network, an EVS IPDirector production asset management system is integrated with four Adobe Premiere Pro CC workstations and two Adobe Prelude ingest workstations. IPDirector, an EVS application running on a Microsoft Windows PC, lets the OBPod engineers instantly share content, edits and metadata. With the application, Gearhouse has complete control over ingest and metadata management, lets users edit on-the-fly and clip, sub-clip feeds and prepare media for edit within Adobe Premiere. Ingested feeds are streamed in real time to a nearline shared storage solution, which is managed by IPDirector. This enables simultaneous access to a single media set for browse clients and IPLink connections from Adobe, meaning there’s no need to push and pull content to and from edit specific storage. OBPod made its debut for Sky Sports at the opening round of the 2015 Formula 1™ championship in Melbourne, Australia in March, and was used at every grand prix throughout the season to deliver live coverage across a race weekend. Third party integration was also very important in the building of OBPod. The IPLink access with Adobe Premiere Pro CC has allowed far greater flexibility than previous systems. Here, key advantages are that both the editor and the producer can access the same indexed and logged media without any requirement to move, and unnecessarily duplicate, media in a separate edit storage pool. The inclusion of IPLink allows editors to work more autonomously, freeing up the IPDirector station for edit preparation and content management. Gearhouse was effectively able to add four additional browsers to the infrastructure, allowing for a big increase in productivity during such a high-paced sports production without additional physical hardware.